Posted on Friday, November 2nd, 2012 at 7:10 am by Ty Anderson. 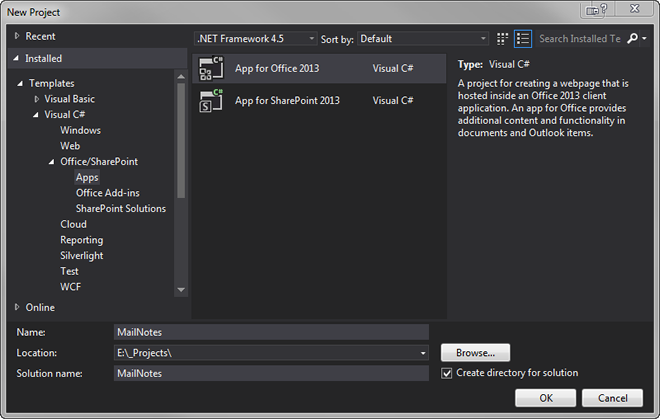 With Visual Studio 2012 open, select File > New Project from the main menu. In the New Project dialog box, select the Templates > Office/SharePoint > Apps node. 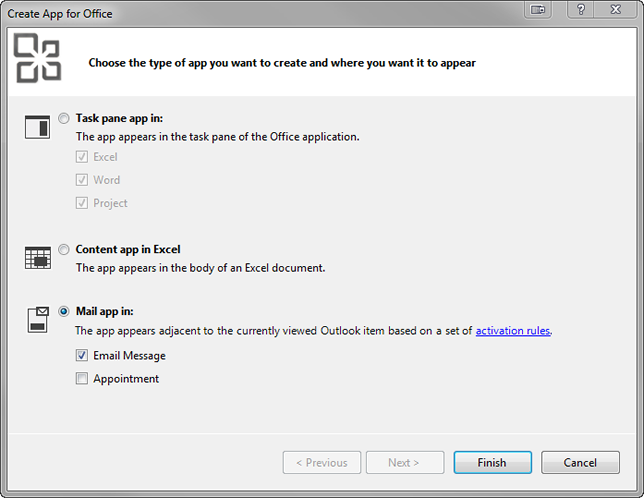 Click the App for Office 2013 project template, name the project MailNotes, and click the OK button. The Create App for Office dialog box will display. Select the Mail app in option and only select Email Message. Click Finishto create the project. MailNotes.html: This file is a web page. It contains the HTML markup used to render the page to the user. It is the presentation layer and you can take advantage of web technologies to create a snazzy display. MailNotes.xml: This is the application manifest. It includes information about your mail app (e.g. DisplayName) along with the rule definitions that specify the activation rules that cause the application to display. The default rule that specifies ItemType=Message is exactly what we need. Clearly, there are more files but let’s cover them another day. We have plenty to do already! 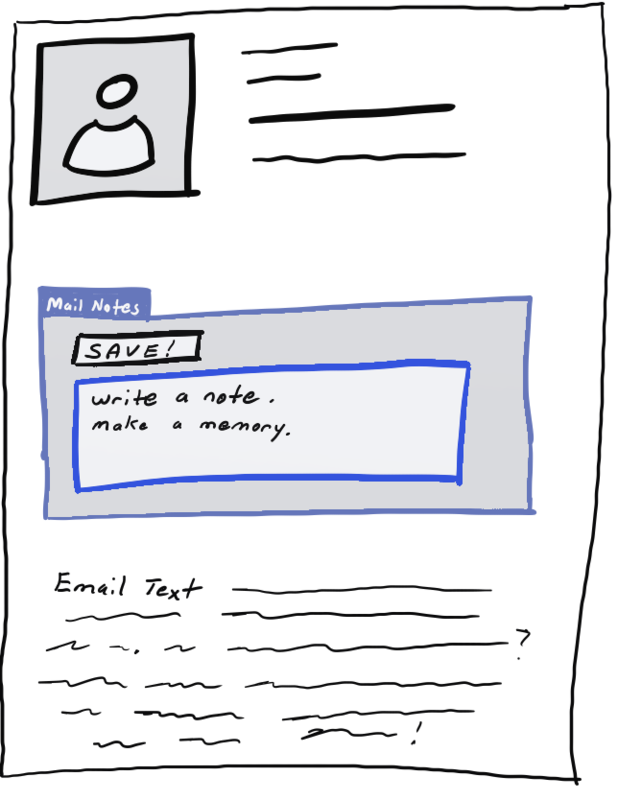 The MailNotes app’s elegance is its simplicity. Anytime a user views a mail item, our mail app will display its button in Outlook 2013. When clicked, the MailNotes “panel” (I don’t know what else to call it) will become visible and display a text area and the button. 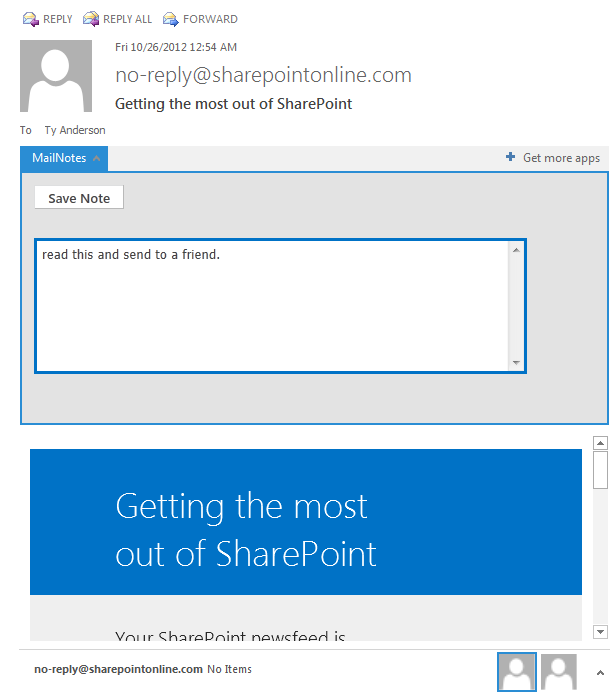 The Outlook user can input a brief note into the textarea and click the button to save their note. If successful, the MailNotes app displays a panel to let them know and provide that ever-elusive warm fuzzy feeling. To implement this design, edit your <Body> tag in MailNotes.html so that matches the code in Listing 1. Now, because I want to make the mail app’s panel look nice and match the new Outlook 2013 and Office 365 “Wave 15″ themes, we need some CSS stylings. Nothing major. Just one little script (see Listing 2) that you need to add within the <Head> tag. This style snippet sets a few properties that will greatly enhance the user experience. The custom code for our Outlook mail app handles the saving of a custom property to the current mail item. The custom property stores the note and saves it to Exchange. What we need is some code to write and read this property. Let’s start by opening the MailApp.js file and adding the code from Listing 3. The initialize event is akin to a COM add-in’s StartUp event. It is the appropriate event for creating references the app will need later. In the case of MailNotes, we need references to the mailbox (_mailbox), the mail item (_Item), and the mail item’s custom properties collection (_CustomProps). Okay fine. We have references now so let’s do something… like add the code from Listing 4. // Callback method after saving custom properties. SaveNote : The Save Note button calls this method to initiate the save process. 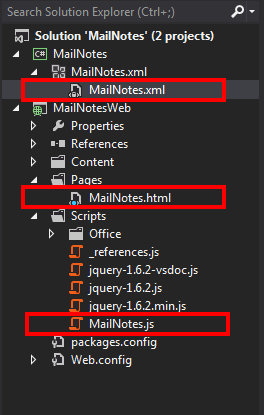 Here, we grab the text from the MailNotes textarea then call setCustomProperty and pass the note text as a parameter. setCustomPropety : This method uses the mail item’s custom properties collection to create custom property and save it. The save is done asynchronously which then calls. SaveCustomProps as a callback method. saveCustomProps : This method allows us to check the success or failure of the save process and respond accordingly. The mail app framework makes it easy for us to check via the asyncResult object. loadCustomProps : This method will attempt to load the custom property that contains a mail note (mail_note). It first checks for the existence of the property and, if found, displays it in the MailNotes textarea. There is one last function and Listing 5 contains its logic. This function uses the color parameter to change the background color of the MailNotes text area. We call it in the textarea’s onblur and onfocus events. 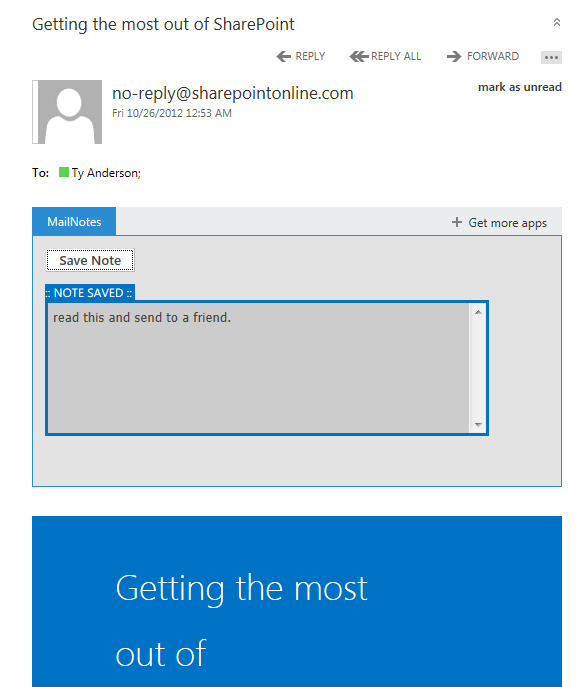 Let’s take our newly created mail app to Office 365 and Outlook 2013 for a test drive. With Visual Studio, loading the app into your Office 365 developer account is as easy as pressing F5… meaning, it is just what you expect. So go ahead and hit F5. The app will compile and you will be presented with the Connect to Exchange email account dialog box. Enter your credentials and click Connect. Visual Studio will take it from there by installing the app in and opening Outlook Web Access. You should be able to select an email and see the MailNotes panel. Simply click it, add a note, and click the Save Note button. Now open Outlook 2013 and navigate to your inbox. Click the mail and open the MailNotes panel. You should see the note you entered in Outlook Web Access. If you don’t, well, you did it wrong! I’m looking to fire off a function when pressing ‘Send’ on a new E-mail. Do you know if it’s possible to hook into this event? I don’t think it is possible. The API for Office Apps is extremely limited. The mail apps are intended to allow a developer to recognize a type of content (e.g. an address, phone number, or email address…) in a mail item and display additional information. What you see is what you get. If you don’t find what your looking for there, it isn’t possible.